The Summer Olympics are still building and drawing big audiences for NBC. So there’s been a respite from significant new program premieres -- unless you’re the entity that never sleeps. On the heels of two acclaimed originals -- Stranger Things and The Little Prince -- Netflix goes aggressively against the grain of conventional wisdom by launching its most expensive and extensive effort to date on Friday, Aug. 12th. That’s when the first six episodes of The Get Down, which constitute Part One, begin streaming in all their vibrant colors and throbbing craziness. Created by Australian film auteur Baz Luhrmann (Moulin Rouge, Strictly Ballroom, Australia and the 2013 version of The Great Gatsby), it’s a $120 million look at the formative years of disco, hip-hop and most emphatically, rap. The setting is 1977 New York City and more specifically the badly decaying and turbulent South Bronx. But five of the six episodes begin in 1996, with a rap summation of previous events. It’s all unlike anything ever made for television, even if there are obvious splashes of West Side Story, Glee and even That ‘70s Show with its goofy, communal pot-smoking scenes. Unfortunately, The Get Down can also be a beat down at times, beginning with an overcooked and run-in-place 90-minute episode in which Luhrmann appears to be channeling the endless wedding reception scene from the late Michael Cimino’s The Deer Hunter. A Gomorrah-like nightclub called Les Inferno is the setting here, with cackling boss lady “Fat Annie” (Lillias White) over-eating the scenery as well. The episode captures this garish scene at undue length before lethal automatic weapons fire at last intervenes to upstage the pulsating disco beat. There’s a lot else going on from many different directions. But at the heart of The Get Down are Ezekiel “Books” Figuero (Justice Smith) and Mylene Cruz (Herizen Guardiola), both of whom are immensely musically talented in their own very different ways. “You sing like red velvet feel,” the poetic Zeke tells her, desperately longing for Mylene to be his girl. But her father is super-stern pastor Ramon Cruz (played by Giancarlo Esposito of drug kingpin Gus Fring fame on Breaking Bad). Spotting his daughter in a low-cut dress, he upbraids her as a “teenage whore” sneaking out to sing “disco garbage” rather than sticking to pious church hymns. It then gets worse for her. Jimmy Smits is the other notably familiar face over these six episodes made available for review. Encased in an array of eyesore leisure suits, he’s Francisco “Papa Fuerte” Cruz, a South Bronx powerbroker who also happens to be Ramon’s brother. It takes a while for Smits to make this character click a bit and emerge as more than a cartoon. There’s also Shaolin Fantastic (Shamelik Moore), a thrill-seeking, acrobatic loner and protege of the quietly imperial Grandmaster Flash (Mamoudou Athie), who calls his pupil “Grasshopper” in the mode of the Kung Fu TV series of the early-to-mid ‘70s. Zeke and his three principal buddies, Dizzee, Boo-Boo and Ra-Ra (Jaden Smith, T.J. Brown, Skylan Brooks), revere Shaolin and hope to somehow bask in his presence. But they get far more than that in due time. The elongated Episode 1 also features a laughably indestructible demo record made by Mylene, who yearns to be a singing star. The record somehow survives a drop from a multi-story building and a few Frisbee-like tosses into hard concrete. 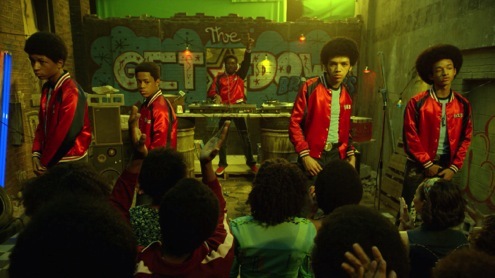 The Get Down is intercut with grainy, real-life footage from the ‘70s and pulsating hits from those times as well as some bracing original music. F-bombs and the n-word are dropped with regularity, as are slurs aimed at the gays who drive a thriving disco scene. It’s said that they can make or break a would-be hit by how frenetically they respond to it on the dance floor. But Zeke’s raps also grow in stature and import. The Get Down’s core is the birth of this genre and what it represents to the trapped denizens of dead end neighborhoods. The Get Down likewise is demonstrably untamed, excelling at times and faltering at others while trying to get away with lines like, “A good steak’s like a prize fight. It ain’t good unless it’s bloody.” That one comes from Fat Annie, whose lair snares younger men, including Shaolin, in search of quick and easy money. Down the stretch of Part One, a washed-up, drugged-out former big-time record producer named Jackie Moreno (Kevin Corrigan) almost steals the whole show with his pathetic attempts to write a hit song suitable for the soaring voice of Mylene Cruz. But somehow, some way . . . well, you’ll see if you hang in there long enough to begin appreciating The Get Down for its sheer, unbridled audacity. Production problems and creative challenges plagued The Get Down, with Luhrmann admittedly on the verge of giving up at several points. But he powered through and has birthed a grossly uneven but still oft-scintillating mess-terpiece. Music-driven series have been plentiful in recent years, with NBC’s Smash and HBO’s Vinyl both falling apart while Fox’s Glee, Starz’s Power and Fox’s Empire have become hits for their respective networks. What happens with The Get Down is very much an open question. It may prove to be too expensive and daunting to last beyond the 12 episodes initially ordered by Netflix. But Part One’s climactic Episode 6 easily is the strongest of the initial batch, with its opening trio of separate but overlapping scenes seamlessly tied to an overall theme of elemental power-wielding. As orchestrations go, The Get Down perhaps has finally found its groove -- and might even stay in it.